The heart and soul of Hilton Head Island is the 12 miles of beautiful beach that visitors and residents enjoy year-round. The beach is also the mainstay of the Island’s environment and economy, and is why thousands live here and millions more visit. Hilton Head Island is the second largest barrier island on the East Coast. Like most islands, Hilton Head is subject to erosion. 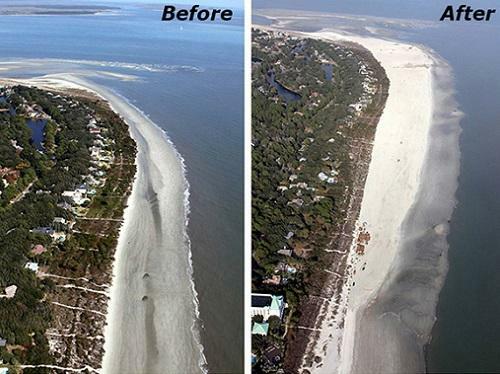 Most beach erosion is a naturally occurring phenomenon with offshore currents redistributing sand and changing the shape of the island. To preserve this beautiful Island and continue to provide residents and visitors with a unique wide stretch of sandy shoreline, a beach renourishment project began in June 2016. This will be the third such project since 1990, which is necessary every seven to ten years depending on storms and weather conditions. 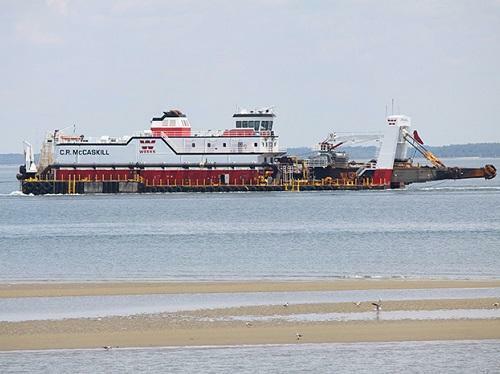 The process will use a dredge, a booster pump, and many miles of pipeline, through which the sand will be pumped, along with attendant tug boats and barges. The land based equipment includes numerous bulldozers to shape the new sand, survey equipment, and support vessels. The 2016 project will expand and build up the beach from South Forest Beach to Folly Field Beach. Construction operations will move along the shoreline at a rate of about 200 to 300 feet per day. Approximately 1,000 feet of beach access will be restricted per day, leaving all remaining Hilton Head Island beaches available for use. Click here for the project timeline map. 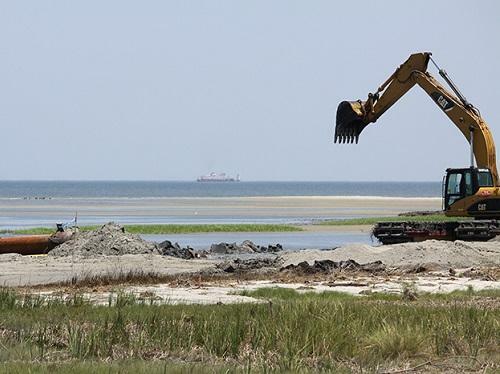 The contractor, Weeks Marine, Inc., is currently working at the “heel” of the Island adjacent to Port Royal Plantation. To date, more than 450,000 cubic yards of sand have been placed. Preparations have begun for sand placement at South Beach later this month. Hydrographic survey crews operating in boats offshore will be collecting data, typically around high tide. Swimmers are asked to use caution in the working areas and to follow the guidance and direction of contractors. 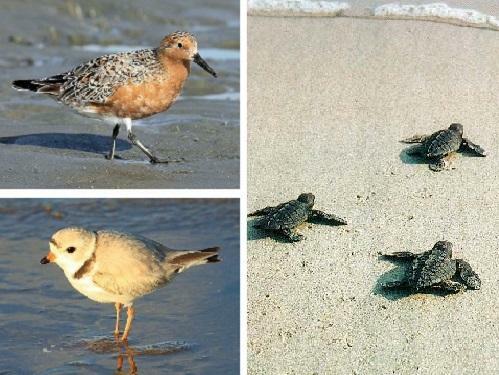 Hilton Head beaches are home to several animals designated threatened or endangered under the Endangered Species Act including the loggerhead sea turtle, the red knot and the piping plover. Since beach renourishment has the potential to disturb their normal habitat, the U.S. Fish and Wildlife Service has required that the Town of Hilton Head work around the times when each species is present. Both the red knot and the piping plover arrive in late August to September and stay until April. The loggerhead sea turtle nesting and hatching season runs from May to October. The renourishment is scheduled to attempt to avoid loggerhead season by working in areas where historically there is less nesting in June, July and early August. This year a record 358 sea turtle nests have been recorded on Hilton Head. The Sea Turtle Protection Project has relocated 300+ nests to the south end of the island to avoid beach construction areas. Click here for a PDF brochure detailing the 2016 Beach Renourishment Project. Check the Town of Hilton Head website for details and updates.